Steps Hotel Berlin kohteessa Berliini, Saksa: Varaa nyt! All bookings are non-refundable. Cancellations and No Shows will be charged with 90% of the total amount. Reductions not exceeding 10% of the total number of guests can be made free of charge until one week before arrival. Halfboard and fullboard is available. Please contact hotel for further information. 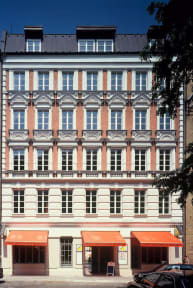 Class instead of mass: Discover Berlin – Stay in the Steps Hotel! The Steps Hotel is situated in a quiet, yet central area. Its a convenient location in the district of Berlin Mitte - Wedding and is the perfect starting point for Berlin visitors to explore the city. Within only 10 minutes travelling time, you are able to reach the Kurfürstendamm, Unter den Linden or Prenzlauer Berg. You can get to Checkpoint Charlie and Kreuzberg on a direct line by metro, without having to change. Our family run business stands for hospitality, quality homemade cuisine and affordable prices. With our 96 beds, the hotel suits youth groups, school trips, families as well as individuals. Not cheap but affordable with a personalised service!